Ever since we announced that Azure Stack is ready to order, we’ve seen a variety of questions related to managing and operating Azure Stack. This blog kicks off a series of blogs addressing these questions. Operating Azure Stack is different. Today, your on-premises IT infrastructure provides a secure and controlled environment for your business solutions, but it also requires configuration, deployment, backup, and management tasks. Your IT administrators spend most of their time on these tasks, to simply keep your on-premises environments running. Azure Stack is an extension of Azure, it enables you to run Azure services in your on-premises environments. That way, you can enable a modern application development environment for your organization across cloud and on-premises, while taking advantage of all the Azure native toolsets and APIs. Managing capacity: Ensuring that your infrastructure capacity is configured to correctly deal with the demands of providing cloud capacity. Checking and maintaining health: From monitoring, security, business continuity, and disaster recovery, you want solutions that address these operational tasks and allow them to focus on service delivery. Managing tenants’ use of resources: Infrastructure is successful only when your tenants are satisfied with the services provided, and you want to be assured that you can successfully provide and operate these services for your tenants. The “Azure Stack Operator” will be responsible for these tasks. It was with these tasks in mind that we made the necessary investments in the infrastructure management capabilities of Azure Stack and in the definition of the “Azure Stack Operator” role. Monitoring and diagnostics: Monitoring, notifications, and management capabilities allow you to manage the infrastructure and service health, performance, and capacity that underlie your tenant workloads. Patching and update: With Azure Stack, you can update your infrastructure software while minimizing the impact on your business applications, services, and workloads. Business continuity: Azure Backup and Azure Site Recovery will enable tenant-driven protection for business applications and services. Security and compliance: Azure Stack has a secure-by-design approach across network, data, and management. Hardware lifecycle management: Azure Stack will have validated workflows to enable the replacement of failed components. Intuitive experiences: A portal and command-line experience highlights the common actions you need to perform. This allows you to make decisions quickly and intuitively. Future posts will also address the ways Azure Stack can be integrated into your existing datacenter including networking, identity, and ticketing and will go into more depth on the Azure Stack Operator role. 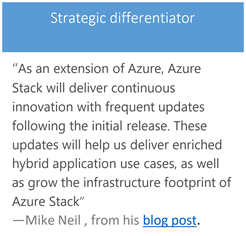 Although many scenarios are familiar, I want to make sure you approach Azure Stack knowing that how you operate it will be different. Your value will not only be measured by how you manage Azure Stack infrastructure, but also by what services you provide to your developer community and how fast you can enable them. At Ignite this year in Orlando we will have a series of sessions that will educate you on all aspects of Azure Stack. See our list of sessions and register to attend. 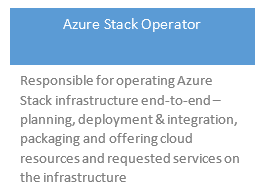 Lastly, the Azure Stack team is extremely customer focused and we are always looking for new customers to talk to. If you are passionate about Hybrid Cloud and want to talk with team building Azure Stack at Ignite please sign up for our customer meetup.